“Conviction,” said Bill. And that resonated. An artist is someone who believes she is an artist, and whose conviction is so strong, she can convince others. Conviction isn’t limited to art, of course. A successful fundraiser, for example, is someone who has conviction that his or her organization deserves your support. 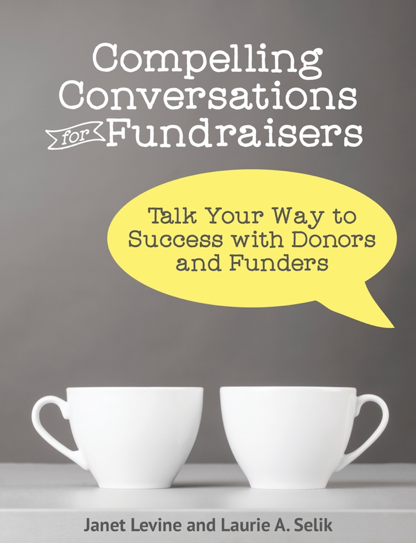 Of course, there are tools and techniques that all fundraisers need, but it starts with that conviction. More, it requires a belief that fundraising is a benefit not just for the organization but also to the donor. And as such, it is good thing to be doing. Too often, people charged with fundraising—professionals and volunteers alike—feel that fundraising is a negative. Something to avoid or do with distaste. And that, while it can still raise some dollars, does not bode well for sustainable success. Likewise, if you are talking with someone about their support, fearing to mention the word “money” seems—well, odd to me. If you call someone and tell them that you are the Executive Director, Development Director, Board member of such and such nonprofit, odds are they know what you are calling for. If they agree to a meeting, they are simply giving you permission to involve them more with your organization. Which puts me back on my soapbox about fundraising. Yes, yes. We need the support and that typically means financial. But it really is more about connecting the donor with the organization so the former feels a passion for the latter. And this passion brings the conviction that not only is this a place that deserves support but that it deserves MY support. This entry was posted in donor centered fundraising, fundraising and tagged development, donor centered, fundraising. Bookmark the permalink.